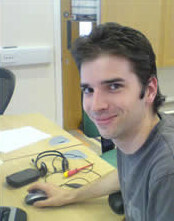 Jason joined the Dyalog team on the first day of May to fill the position of IT Manager. His primary responsibility will be to manage the rapidly growing collection of machines which Dyalog uses for development and QA on the wide variety of platforms that Dyalog runs on – from PDAs running Windows Mobile to large UNIX Multi-processor systems. Jason will also play a role in the Development team, with a focus on Quality Assurance and Product Installation & Configuration. Jason has always been interested in computing and programming and he has entrepreneurial skills as well – which was evidenced when he established UK Datastore Ltd. He is currently in the process of completing his MCSE 2000/2003 qualifications and has excellent knowledge of Linux/UNIX and versions of Microsoft Windows – including Vista. Jason has previously worked in positions within IT support, IT Consulting and Network Administration. In his spare time Jason enjoys facilitating Youth Club activities and he has taught juggling skills at Circus level – something which we're sure he will find much use for once he starts juggling all the tasks that will fall on his plate in Dyalog.